The amazing Becky Cawood (a BURN instructor) and me post Burnbox class. Jab, cross, hook, hook — I repeated the combo in my mind as I whacked into the bag, trying to tap into a punching groove. 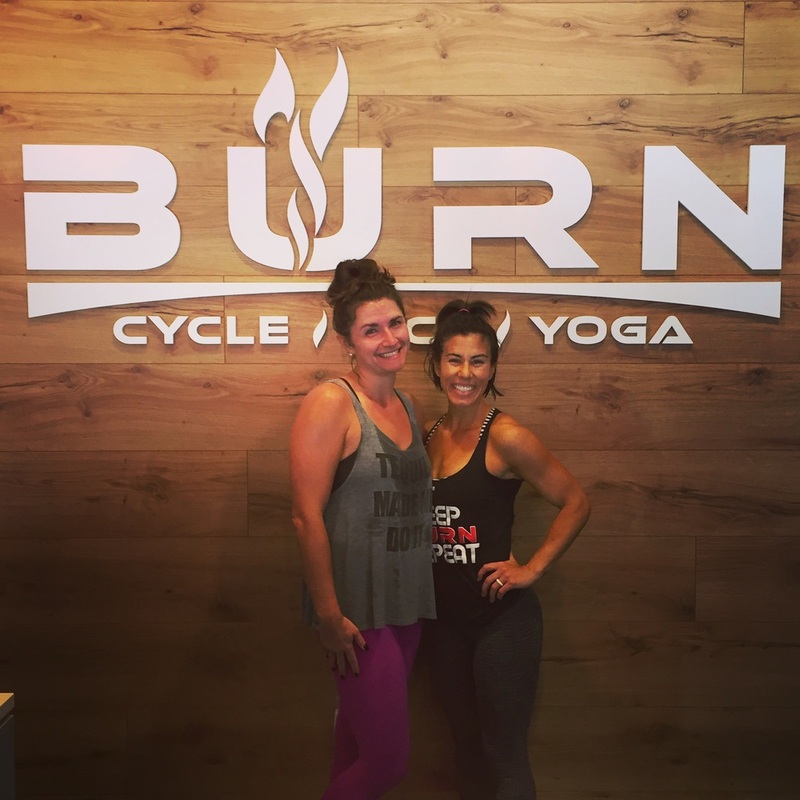 Welcome to Burnbox at Brookhaven’s latest fitness studio addition: BURN. Recently, the studio reached out to me to come in for a class (so, FYI, I was hosted), and I gladly accepted. One of the things I liked right away is that BURN doesn’t just focus on one type of class format. Instead, clients get to choose from indoor cycling, yoga, and kickboxing formats. Since this former cardio kickboxing instructor has always been a sucker for anything kicking and punching, I opted for the 45-minute boxing format with Matt. What sets this format apart is that it actually integrates heart rate monitor technology (the studio provides these) to ensure that you’re training in specific target zones for a more efficient workout. Unfortunately, the day I took class the monitors weren’t up and running, since the studio was still working out the just-opened-its-doors kinks. But I still think it’s a neat idea. After putting on the gloves that were provided, class got started. Matt had us work through combos of kicking and punching on the bag followed by planks, push-ups, and other exercise challenges. Needless to say, I was sweaty and well worked by the end of the class. The only thing that didn’t jive as well with me (because I’m a former group fitness instructor who is a little OCD about doing things equally on both sides of the body) is that Matt often didn’t have us repeat the combo on the other side of the body. Again, I got an awesome workout. But I was just a little unclear as to whether I was missing him telling us to switch sides or he wasn’t. Anyway, I passed the feedback along to the studio and was told it would be put to good use. And in spite of my equal side issue, I would absolutely check this “fit” out again. Not only do I want to try out the heart rate technology, but I also want to give the yoga and cycling formats a try, too. I’m looking forward to feeling the burn again soon!